The historic Anglican Church was founded when Pope St. Gregory the Great sent Saint Augustine of Canterbury to England. Prior to the Protestant Reformation, the Anglican Church (the Catholic Church in England, as distinct from later Protestant establishment) provided numerous Cardinals and even a Pope. Some of these Cardinals served in England, some of whom served elsewhere in the world. Some of them also had connections to what would become Old Roman Catholicism. As a modern day continuation of the pre-Reformation Roman Catholic Church in England, this period is of particular historical relevance to the Old Holy Roman Church of the English Rite. After the start of the Protestant Regormation, it took centuries for Anglican tradition and Old Roman Catholicism to converge within this Patriarchate. Today the Old Holy Roman Church of the English Rite preserves the venerable combination of Anglican heritage and Roman Catholicism as it spreads the message of Christ's Holy Gospel around the world. 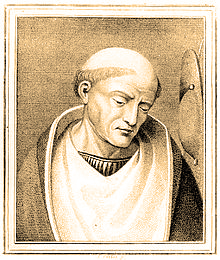 Saint Bernard wrote to Cardinal Pullen in 1145 asking him to counsel and console the newly-elected Pope Eugenius III, who first granted autonomy to the See of Utrecht. Cardinal Bishop of Albano. He was the only Englishman thus far to occupy the Chair of St. Peter. He went to France and became a Canon Regular of the cloister of St. Rufus monastery. He later served as a papal legate to Scandinavia and helped to form Cathedral schools in the bishopric cities there. He was elected Pope in 1154. Cardinal Priest of San Crisogono. Archbishop of Canterbury from 1207-1228. He played a central role in the dispute between King John and Pope Innocent III, the crisis of which led to the Magna Charta. He is also credited with the division of the Bible into chapters in the form still used today. Cardinal Priest of S. Stefano al Monte Celio. He served as Chancellor of the University of Paris and became a Cardinal in 1212. He took an active part in the campaign against heresy in France and accompanied the Fifth Crusade into Egypt as the Legate of Pope Honorius III. Cardinal of the Church of San Eustachio. Cardinal Bishop of Porto and Santa Rufina. Dean of the Sacred College of Cardinal in 1273. Also a Cistercian Abbot. Archbishop of Canterbury. Member of the Dominican Order. Regent of Oxford University. Cardinal Bishop of Porto and Santa Rufina in 1278. Cardinal Priest of San Lorenzo in Lucina. Having earlier served as Archdeacon of Worcester, he was personal physician to Pope Martin IV. Cardinal Priest of Santa Sabina by Pope Benedict XI. It is unclear whether the information of his appointment reached him before his death or not. 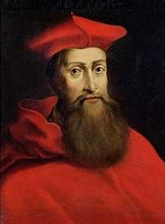 Created Cardinal by Benedict XI, he wrote several works on philosophy and theology. A Dominican, he was a Master of Theology at Oxford University. Created Cardinal Priest of Santa Sabina in 1305. Archbishop of Canterbury, having previously served as Bishop of Ely and Treasurer of England. Cardinal Priest of San Sisto Vecchio. His library and his estate were left to Westminster Abbey. Dean of York and Cardinal Priest of Santa Cecilia in Trastevere. He was a staunch supporter of ecclesiastical power and composed the Office of the Visitation of Our Lady. Bishop of Winchester. He was made a Cardinal in 1426 and served as a papal legate to Germany, Hungary, and Bohemia. Archbishop of Canterbury. Lord Chancellor of England. Cardinal Bishop of Santa Rufina. 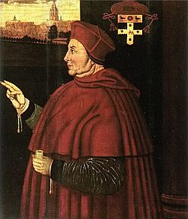 Created Cardinal in 1473. He served as Lord Chancellor of England during the start of the War of the Roses. He served as Bishop of Worcester, Bishop of Ely, and Archbishop of Canterbury, as well as Chancellor of Oxford University. Archbishop of Canterbury. Cardinal Priest of Santa Anastasia. Lord Chancellor of England under Henry VI. Archbishop of York. Cardinal Priest of Santa Prassede. Archbishop of York. Created Cardinal Priest of Santa Cecilia by Pope Leo X, who confirmed the autonomy of the See of Utrecht, which thereafter was known as the Leonine Privilege. Perhaps most famous as Lord Chancellor of England under Henry VIII and for building Hampton Court Palace. Though he (unsuccessfully) appealed to the Pope for the annulment of Henry VIII's marriage to Catharine of Aragon, he remained loyal to the Church and ultimately lost the favor of the King. Cardinal Priest of San Vitale. 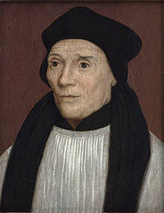 Bishop of Rochester. He was executed by order of Henry VIII for refusing to accept the King of England as the Supreme Head of the Church of England and for upholding the doctrine of papal primacy. Archbishop of Canterbury, he was the last Catholic to hold this office. Though not yet ordained at the time, he was created a Cardinal by Pope Paul III. In addition, the two senior-most members of the College of Minor Canons of the Cathedral of Saint Paul in London, which is part of the post-Reformation Church of England, are titled Cardinal. One is the Senior Cardinal and the other is the Junior Cardinal. For more information on this historic college of minor canons that predates the Norman Conquest of England, continue reading here. These offices continue to this day.